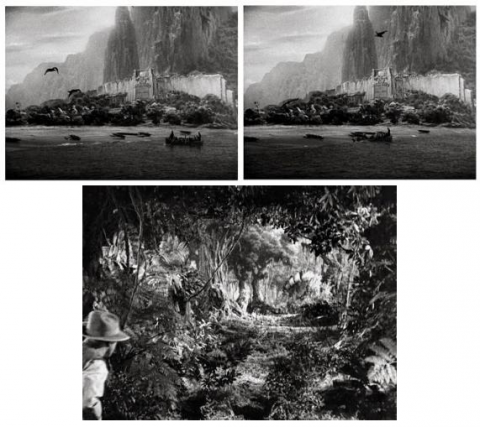 For over a century, matte paintings have abounded in films. This trick consists in enlarging a “real” space with a decorative painting, via different techniques. Like any faking, matte painting strives to create a particular illusion, in this case to give the impression that the painted scenery actually exists. To achieve this “trick of the camera,” the artists constantly try to draw the viewer’s eyes to specific parts of the image, to details that are used to authenticate the rest of the shot, thus diverting the spectator’s attention from areas that could reveal their true nature and destroy the illusion. This article analyzes the modus operandi of the “illusionistic detail,” especially that of moving details such as birds, and the issue of the ripple effect of illusion, from the detail to the shot, to the film. 1Since its inception by American Norman O. 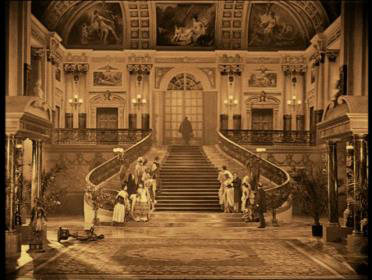 Dawn in 1907, matte painting has spread out in cinema, in all countries, in every genre and in every era. The technologies used to expand real sets through paintings have evolved, from a simple painted mirror inserted between the camera and the scenery, to the contemporary digital matte paintings consisting of millions of pixels. However, from 1907 to the present time, the same principle underlies these technologies: the creation of illusion. In any case, the spectator must perceive a huge city, gigantic castle, monumental church (fig. 1) or the ceiling of a ballroom (fig. 2). However, he/she must not see the painting. Like any special effect, the technique must be imperceptible in order to ensure the occurrence of the effect. Consequently, the matte painting experts resort to a certain number of tricks to erase the very idea of painting from the spectator’s mind. If it seems obvious to spectators that Blade Runner’s futuristic city (Ridley Scott, 1982) was not entirely built for the wide shots, they cannot realize, without additional information on the film, that the top of the monumental stairs in Nana (Jean Renoir, 1925, fig. 3) is a painting, just like Scarlett’s house in Gone with the wind (Victor Fleming, 1939). End of the world, Abel Gance, 1930 (painting by Walter Percy Day): if you look carefully, you can see the separation between the bottom of the church (a “real” set) and its top (a painting). The dividing line starts just over the extras’ heads, at the top left, and extends over the curtain, before eventually going back to the right. © Archives Walter Percy Day, Susan Day’s property, Paris. 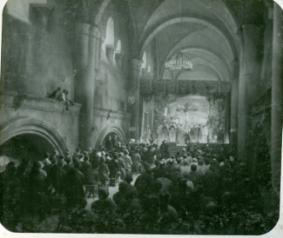 The Hunchback (1924 or 1934 version), one of the numerous ceilings painted by Walter Percy Day during the 1920s and 1930s. Nana, Jean Renoir, 1925, painting by Walter Percy Day1; as it is often the case, the bottom is a real set, including the doors, while the top is a painting. © Extract from the DVD, ARTE Vidéo. 3 Miriam Milman, Le Trompe-l’œil, Genève, Skira, 1982, p. 7. 3A trompe-l’œil that would really deceive the eye would no longer be a trompe-l’œil… In other words, the trompe-l’œil would fall within the category of simulation5 rather than illusion, according to Calabrese.6 In any case, it would never be misleading. “As a result, we should define the trompe-l’œil as a paradoxical visual expression, rather than a deception of perception. In fact, if its efficiency depends on the artist’s ability to make the most of the technical resources of perspective, it is also true that this very ability eventually gets mixed up with the resulting image. The trompe-l’œil is as revealing as it is concealing.”7 In the end, the spectator must see the formerly concealed painting in order for the effect to occur. 5If matte painting fools an “eye,” it is in fact the camera’s rather than the spectator’s: the camera could indeed move sideways and reveal the trick.9 The painting is created for the point of view it provides, which will subsequently become the spectators’, forced as they are to adopt the position they are ascribed. The transformation of the camera and the distortions induced by its mediation are taken into account in the design of a matte painting, which explains that the matte painting processes are eventually very similar to the hyperrealism of trompe-l’œil, although the implementation of the former results in diametrically opposed effects. 6In order to achieve this “perfect” illusion, matte painters focus their work on the spectator’s perceptive limits. In this respect, they benefit from the limits of perception that are inherent to camerawork or are created through editing. Matte paintings are therefore precise compositions based on a thoroughly thought-out art of detail. Matte painters insert illusionistic—hence authenticating—details into specific parts of a shot, on which they draw the spectator’s attention, so as to prevent “disillusionistic” details from interfering with the creation of illusion. Directing the spectator’s look is therefore a prerequisite for this type of illusion, much in the same way as the diversion of the spectator’s attention is essential in the field of conjuring. 11 Rudolf Arnheim, Le Cinéma est un art, Paris, L’Arche, 1989. 12 Jean Epstein, Bonjour cinéma, Paris, La Sirène, 1921, p. 37. 8This principle, clearly highlighted in the context of matte painting, is also applied to cinema as a whole, as Arnheim postulated in 192911 as he put forth the notion of “partial illusion”: full reproduction is unnecessary to make an impression, as one only perceives a few details of life. To quote Epstein: “to see is to idealize, abstract and extract, read and choose, transform. On the screen, we see once again what cinema has already seen, the transformation is a dual one or rather, it is multiplied, squared.”12 This explains both the closeness and distance between the spectator’s eye and the camera: the camera records everything at once, down to the finest detail, while the eye, with the help of the brain, sorts, organizes and observes the world through small touches, since the human field of vision and visual attention are limited. 10To consider the look as resulting from the actions of the eyes and brain entirely partakes in the reflection on the creation of matte painting. Chris Evans adapts the aforementioned theory of a painting’s strong points to the specificities of matte painting, by highlighting what he calls the “pyramid of believability.” According to him, the eyes generally browse an image from left to right, alternately from bottom to top and back, forming a vision triangle (the so-called pyramid of believability): “If the spectator’s eyes analyze all three parts of an image and interpret them as believable, then he/she will probably deem the whole image as believable.”15 Consequently, the matte painter will regard these very spots as the perfect places to put the details authenticating his/her work and enabling him/her to turn the painting into film. 18 Quenu, “L’art de la décoration au cinéma,” Cinémagazine, 26 December 1924, p. 562. 19 Richard Schickel, “Far beyond reality,” New York Times, 18 May 1980, p. 56. 20 Ira B. Hoke, “The cinema art service,” International photographer, April 1929, p. 12. 15Every matte painting includes its painted details (the painting is but a sum of details). The point is to see how far the painter will go in terms of choices—amount, place, role of details. However, the moving elements remain the most “efficient” yet complex details, for “the fundamental rule of cinema is that it must be in motion. The most static landscape must always integrate a bustling place.”21 These moving elements are particularly eye-catching and guide the spectator’s look. 16In the moving details of matte paintings, one can find every atmospheric effect—rain, wind, clouds, snow. Their triviality makes them absolutely imperceptible to the spectator. It is precisely this triviality that must be emphasized: the wind and rain are exposed “as if” the camera just happened to end up there. Besides, these elements require a massive amount of work, which seems disproportionate in view of the spectator’s inability to perceive them. At first, the spectator cannot imagine that a cloud or its motion may have been faked. 22 Syd Mead about Blade Runner, L’Écran fantastique, no. 26, September 1982, p. 43. 17Nondescript at first sight, these elements have a primary purpose, which consists in erasing the technical dimension and its specificities (fixity, particular texture, lack of relief, smallness). Just like water or smoke, clouds introduce a scale. Each element, known to the spectator, provides the image with a size reference, as well as relief, depth and motion. 23 Don Jahraus, “Making miniatures,” American Cinematographer, November 1931, p. 10. 19Apart from the moving atmospheric effects, the use of luminous events as hooks is frequent, like the blinking neon lights in Citizen Kane (Orson Welles, 1940, fig. 4) or the continuous light of the castle in the introduction to the same movie. On the left, the neon lights just above the shop windows are on, while they are off on the right. Citizen Kane (Orson Welles, 1940, painters: Mario Larrinaga, Chesley Bonestell and Fitch Fulton). © Extract from the DVD, Éditions Montparnasse. 21This light signal has a dual effect. It draws attention on the characters and allows to see them moving forward. It also helps to understand the development of the story. Therefore, the issue pertains to narration. But at the same time, this attraction helps draw the spectator’s attention away from the generator and its cartoonish aspect, despite the huge place it occupies on the right side of the image. In this case, the issue pertains to aesthetics. It is quite difficult to find the balance between “perceiving” a place, not seeing it (the painting), or perceiving (an authenticating detail) without seeing (an illusionistic detail). The key points that help draw the spectator’s attention are more closely related to the illusionistic diversion of attention than the theory of strong points in painting. In fact, contrary to painting, the matte painting shot includes movements, if only for the movements of the actors integrated into the painting (who, of course, partake in this work). These movements constantly shift the “strong points” of the painting, here formed by the authenticating details. A shot from Forbidden Planet (Fred McWilcox, 1956, painter: Matthew Yuricich); the flashing light above the actors catches the eye and prevents one from getting lost into the deep perspective, so that one can watch the main action unwind. © Extract from the DVD, Collection Fnac. 23This is the case for the painting of the wide-angle shot in Earthquake (Mark Robson, 1974, fig. 6), which is systematically used as an illustration in the various articles dedicated to Whitlock’s work. In this painting, we can see a ruined city, where several fires are raging, judging from the visible flames and smoke. Some parts of the image are very detailed, while others are imprecise, blurred—or to quote the painter’s assertions found in numerous interviews, they fall within the impressionist style. Placed on either side of the image (thus confirming Evans’s notion of the pyramid of vision), the two tallest buildings hold our attention. In the background, the landscape is completely swamped with paint. Just to the right of the central building, the edifices are fuzzy, although they are close to our focus point. 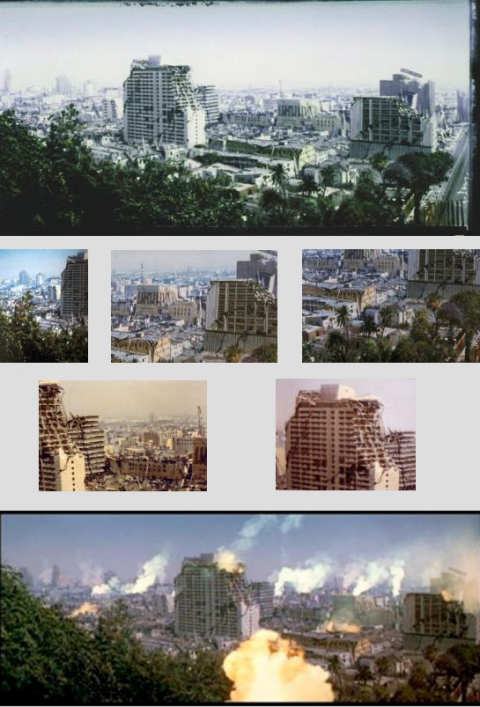 The painting, details of the painting and final shot of Earthquake (Mark Robson, 1974) between the painting and the end result, the moving “gags” add elements that divert the spectator’s attention, who is unable to notice, despite its marked pictorial aspect, this “impressionist” matte painting, to quote its creator Albert Whitlock. © Peter Cook’s blog [http://nzpetesmatteshot.blogspot.fr]. 24When we compare this painting with the screened result, it is easier to understand the importance of “gags” for Whitlock. The fires create a visual process for the spectator to follow, which goes from one smoke trail to another, considering that motion incites the spectator to browse from left to right—which he/she naturally does already—, therefore going from the most detailed part to the most blurred. 25These fires establish an immediately visible scale for the spectator, while providing the image with depth, as the nearby fires are bigger than the distant ones, the latter coinciding with elements of the painting. In this sense, these elements convey an impression of relief that offsets the “flat” aspect of the painting. Apart from bringing a touch of color that enhances the other orange fires (to the left, upper middle and right), the fire in the foreground affects the spectator’s vision through its proximity and threatening aspect. 26As the spectator’s mind cannot imagine a fire coming out of a painting, the illusion here allows the fixity of the painting to go unnoticed, just like the absence of characters in this shot—no one is gesticulating at the windows of the main building, no one is moving in the streets, no panic reaction, as opposed to the other shots of the film that constantly show the spectator the panicking crowds in the streets. 27This painting by Whitlock was used again in a TV film called Mission Galactica: the Cyclon Attack, directed by Vince Edwards and Christian I. Nyby II (1979, fig. 7). From a diegetic perspective, the damages are caused by aliens this time, not by a natural disaster. Nevertheless, the interest of this shot lies in the fact that it adds a moving element: the flying saucers. These flying saucers present a variation on a classic theme of matte painting, i.e. the recurrent presence of birds flying away, which will be taken over in many films, from King Kong to Star Wars. 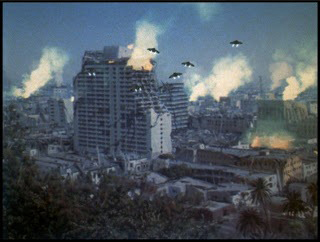 The same shot as in Earthquake, with the addition of flying saucers in Mission Galactica (Vince Edwards and Christian I. Niby II, 1979). 28Birds are permanent residents of matte paintings. They have managed to migrate and reproduce through their transition to the digital format. Birds are included in The Mummy’s first shot (Stephen Sommers, 1999), which opens on a zoom-out starting at the top of a pyramid under construction and ending on a wide-angle shot of the construction site. As he arrives in Rome, the Gladiator (Ridley Scott, 2000) is accompanied by small birds. In the same way, we can find small birds in the shot of Alexandria in Alain Chabat’s Astérix et Obélix mission Cléopâtre (2001) or in the spaces of Naboo in George Lucas’s Star Wars 1 (1999). They are already present in King Kong, The Son of Kong (Ernest B. Schoedsack, 1933), Mary Poppins (Robert Stevenson, 1963), The Agony and the Ecstasy (Carol Reed, 1965), Black Narcissus (Michael Powell and Emeric Pressburger, 1946). Although it is quite easy to place digital birds in a digital painting, all of the aforementioned birds were either animated shot by shot (King Kong), or separately shot and optically integrated into the shot (for instance in Mary Poppins). 30Standing out against these clouds, birds greatly contribute to the concealment of technique. First of all, they provide the spectators with a scale reference, considering that the latter have all seen birds in “real life,” even if they have never seen these specific birds (the birds on planet Naboo, for example). Consequently, they draw on their personal experience and knowledge of birds to determine the size of the ones they are shown. In so doing, the small size of the painting is obliterated by the bird’s presence. 31Secondly, the living bird breathes life into the painting through a ripple effect: since a bird is flying over, in and out of these spaces, then there must be some depth to these spaces, which means that they are able to contain living entities. Subsequently, these spaces are “realistic,” if not real. This point makes up for the painting’s inherent lack of depth, thus further contributing to break the causal link between the “painting” and this effect in the spectator’s mind. 28 Interview with Réjane Hamus-Vallée in Paris, 13 May 2013. 29 As the pigeons in these shots were dark, their negatives were used for the final shot. 33This is all the more relevant as birds stand in stark contrast with the background, to which they are opposed (in terms of contrast): in Mary Poppins, the white birds stand out against the dark background,29 while in The Son of Kong, the black birds stand out against the clear background sky. 34As early as 1933, in King Kong (fig. 8), birds appear numerous times: as the crew arrives on the island, then as the crew encounters a dinosaur for the first time, a triceratops about to charge. Right before the dinosaur appears, the crew discovers the dinosaur’s track, which is a classic metonymy that draws on the spectators’ general experience: indeed, they have already seen animal tracks (in the mud or snow). Quite simply, this universal experience is here put into perspective by the impressive size of the track—no spectator has ever seen such a huge track. In the same way, once the crew has seen the track, Denham mentions the presence of birds in his dialogue line. The background noise (peeps) suddenly becomes audible, even though it has been there since the beginning of the sequence, albeit completely unnoticed in the background noise. As we move on to the next shot, the same birds fly away in the background, unsurprisingly from left to right, shifting our focus. The point of this maneuver is to have spectators authenticate the dinosaur, through the same principle as the one used during the arrival on the island, using birds as guides. 35Once again, these birds go completely unnoticed by the spectator. Although the latter have followed the birds with their eyes, their brain has “corrected” this perception by classifying it as “commonplace” and therefore secondary. It is indeed common to see a flock of birds flying over a place, all the more so that experience demonstrates, just like in King Kong, that man’s presence (or the dinosaur’s) disturbs the bird that flees whenever it hears a loud noise. The arrival on the island in King Kong accompanied by birds, and the triceratops, again with birds, top left (Merian Cooper and Ernest Schoedsack, 1933, painters: Mario Larrinaga and Byron Crabbe): each time, the birds create a point of attraction, providing the shot with a viewing order. © Extract from the DVD, Universal. 30 Birds offer an advantage in that they can be found in all environments, including cities. 36Birds have been used exponentially in matte paintings, especially in their digital versions, although some painters experiment with variants of birds: the flying gremlin in Joe Dante’s Gremlins 2 (1988), flower petals in Gladiator, spaceships in Star Wars 1—these elements are made commonplace through the film’s narration. Although from a diegetic point of view, it is logical to see birds overrun the wilderness in King Kong,30 it would not be as logical to see flower petals flying over the ship as it docks alongside. Together with the composition of the shot, the scenario makes the elements in the shot, and in fact the whole shot, trivial and imperceptible. The repetition of these shots also allows for the banalization of their role in cinema: there are countless films and sequences opening on a wide-angle shot of exposition, which determines the place and space where the scene, or even the film, is going to take place. The spectator is familiar with this structure, which eventually results in the banalization of this kind of wide-angle shot containing matte paintings. 37Here, Craig Barron raises the issue of the ripple effect of illusion. When the shot containing a matte painting is accepted by the spectator, then the whole space-time of the film is made credible. The wide-angle shot in Nana is only used twice throughout the film. The rest of the time, the shots are close to one another, revealing only a tiny part of the scenery. However, through these shots, spectators get to know what is virtually out of the camera frame and goes together with the limited space that they are shown. The matte painting shot must be sufficiently striking to partake in the imaginary construction of space-time in the rest of the story. 38At its level, the wide-angle shot containing a matte painting constitutes an illusionistic shot, which contributes to the creation of the global illusion in the movie. In this sense, it works like an illusionistic detail that provides the rest of the film—in other words, a combination of illusionistic details of various natures—with credibility. In this respect, working on matte painting allows for the mise en abyme and clear presentation of the various illusion processes. Isn’t the perfect illusion that matte painting tries to achieve—especially through the imperceptible effects of which spectators are the unaware victims—something else than what cinema globally aims to attain? 1 One can find a sketch of this painting in the Jean Renoir collection of the Cinémathèque française, which clearly shows the cover lines and the methods used. 2 Anne-Marie Lecoq, “‘Tromper les yeux’, disent-ils, xive-xve siècle,” in Patrick Mauriès (ed. ), Le Trompe-l’œil, Paris, Gallimard, 1996, p. 96. 4 Hence the need to select an everyday object as our subject. An object that is known to the audience, in order to offer a basis for the comparison with its representation. 6 Who suggests the idea of “trompe l’intelligence” (deceives intelligence), rather than trompe-l’œil (deceives the eye). 7 Omar Calabrese, L’Art du trompe-l’œil, Paris, Citadelles et Mazenod, “Les phares,” 2010, p. 51 sq. 8 According to Christian Metz (in “Trucage et cinéma,” Essais sur la signification au cinéma, Paris, Klincksieck, 1972, t. 2, p. 173-192),the trick is always related to the “confessed plot,” especially in the discussions on the film, which in his opinion reveal the trick—and therefore turn it into a trompe-l’œil, as the film deludes the spectator, while the discussions on the film disillusion him/her. However, this comment does not apply to all effects and particularly to the imperceptible effects which are central to matte painting. Here, just like for any other special effect, professionals strive to create an effect without a cause and hide the technique (painting) to show only the effect (large space). Cf. Réjane Hamus-Vallée, Les Effets spéciaux, Paris, Cahiers du cinéma/CNDP, “Les petits cahiers,” 2004 and Caroline Renouard’s thesis, Les Effets esthétiques et narratifs de la technique de l’incrustation. L’image composite dans les mises en image(s) spectaculaires, under the supervision of Giusy Pisano, Marne-la-Vallée, Université Paris-Est, 2012. 9 Cf. the much analyzed opening scene of Brian de Palma’s Body Double (1984), in which the full-screen landscape soon turns out to be a scenery painted by two characters. 10 Richard Rickitt, Special effects, the history and technique, New York, Billboard Books, 2000, p. 198. 13 Christian Matras, « Une conception de l’image », Le Technicien du film, no. 212, February 1974, p. 46. 14 In Richard Rickitt, Special effects, the history and technique, New York, Billboard Books, 2000, p. 197. 15 “If a viewer’s eye scans these three broad areas of an image and reads them as real, then he or she will probably accept the whole image as genuine,” Richard Rickitt, Special effects, the history and technique, New York, Billboard Books, 2000, p. 197. 16 Where does the expression “leaves move” come from exactly? Could it be another myth, in the same vein as that of La Ciotat? The critic of La Poste, 30 December 1895 issue, indeed points out that “in the far distance, trees move,” but this is not the exact wording. The same goes for Maxime Gorki’s text date 4 July 1896, published in Nijegorodskilistok and stating that “ash-grey foliage is blowing in the wind”; both texts are copied by Emmanuelle Toulet, Cinématographe, invention du siècle, Paris, Gallimard, “Découverte”, p. 135 for the former, p. 136 sq. for the latter. 17 One can quickly assess the evolution of this look by screening the film to a 21st century audience and asking them after the screening where the scene is located. The experiment has been repeated with no scientific purpose among a master’s class since 2003. The students are able to “approximately” locate the scene, although none of them is able to mention the tree leaves. The contemporary vision has ordered information and focused on the action (the baby’s dinner), influenced by the title and pictorial composition. The leaves seem so “normal” to us that they are no longer seen as they are, but simply for what they hint at. 21 Albert Laffay, Logique du cinéma. Création et spectacle, Paris, Masson et Cie, “Évolution des sciences,” 1964, p. 115; this rule is simply based on the experience of human vision, i.e. as everything moves around us in our everyday life, it is hard to imagine a place where nothing moves. 24 Interview with Peter Cook, available on his blog: [online] http://nzpetesmatteshot.blogspot.fr [accessed 22 July 2015]. 25 Such is the opinion of Cotta Vaz Mark and Barron Craig, among others, The Invisible Art, the Legends of Movie Matte Painting, San Francisco, Chronicle Books, 2002. This work is unique and exceptional in terms of the accuracy of the elements it contains and its huge number of illustrations. The very word “gag” is interesting, as if the addition of moving details, necessarily implying complex devices, was considered as a “joke” in itself. 26 Schickel Richard, “A conjuror of catastrophes and castles,” New York Times, 18 May 1980, p. 68. 27 Maurizia Natali, L’Image paysage, iconologie et cinéma, Saint-Denis, Presses Universitaires de Vincennes, “Esthétique hors cadre,” 1996, based on Hubert Damish’s works on this issue, p. 67. 31 Interview with Craig Barron, in Richard Rickitt, Special effects, the history and technique, New York, Billboard Books, 2000, p. 196. Réjane Hamus-Vallée is a Senior Lecturer (with a habilitation to supervise research) in the Department of Sociology, at the Evry Val d'Essonne University, where she directs the Professional Master’s Degree “Image and Society: Documentary and Social Sciences.” She is also a member of the Center Pierre Naville. She has published several books and articles on the issue of special effects (including Les Effets spéciaux, Cahiers du Cinema/CNDP, “Les petits cahiers,” 2004 ; Du trucage aux effets spéciaux (ed. ), CinémAction, no. 102, 2002; “Le morphing,” in Beau, Frank, Dubois, Philippe et Leblanc, Gérard (eds. ), Cinéma et dernières technologies, De Boeck, “Arts et cinéma,” Brussels, 1998, p. 207–223). She is also working on “new technologies,” film professions and filmic and visual sociology (Sociology of the image, Sociology by the image, CinémAction, no. 147, 2013).